Bumperboy enjoys the view at Whitehaven Beach in the Whitsunday Islands. September 2004. 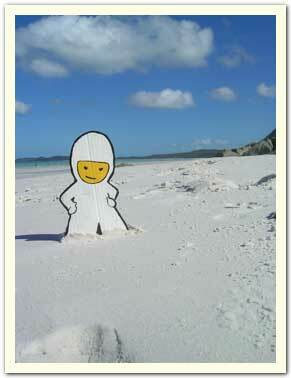 Photo taken by Molly S.
Bumperboy catches some rays at Whitehaven Beach. Earlier, Bumperboy was on the catamaran 'Powerplay' for a couple of days - living the lifestyle of the rich and famous! 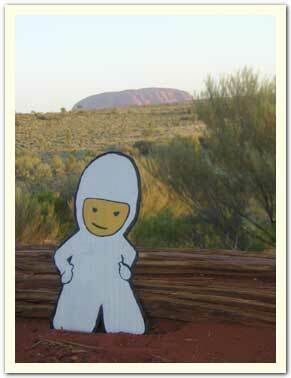 Bumperboy at Ayers Rock (Uluru). October 2004. 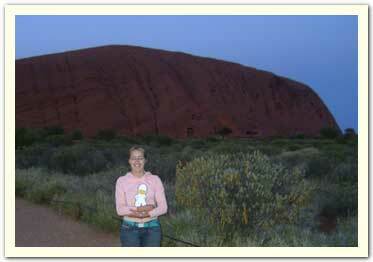 Photo taken by Molly S.
Molly poses in front of Ayers Rock with Bumperboy on her birthday, at sunrise.